Food will be available. Big Papa’s Country Kitchen will be on site. This is your opportunity to try their award winning cuisine. The 4 stages will employ fun reactive steel. Each time you hit the steel will make a noise fall down or move. The vendors area will be close to the action. We will emphasize fun over competition. We will have (at no charge) Loaner GLOCK’s. and ear and eye protection (at a nominal cost), available if needed. As of now we have 5 GLOCKs to give away ( only 1 GLOCK is tied to winning a stage on the match and then a drawing from the stage wining tickets. Any stage won grants the winner one ticket ). You don’t have to shoot to enter your tickets into the door prize drawing. Even if your ticket gets picked during the match and you win a smaller prize your ticket will still be put into the big prize drawing at the end. You can shoot guns other than GLOCKs but only GLOCKs are eligible to win a stage. 3 are door prizes and 1 is a door prize for the volunteers. There are many other prizes donated by the vendors / sponsors listed below. Click on the company logo for each sponsor to find out more about their products/services. Safariland main site sells at MSRP. We sell at MAP which is 20%less. The coupon is for an additional 20%, which should yield 40% overall. That is the same as the discount cards Safariland gives out. 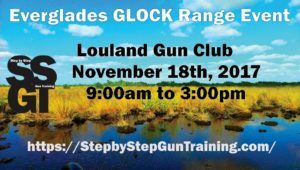 Organized by Step by Step Gun Training Check out the website for details and updates https://stepbystepguntraining.com or call 239-641-6140. You will need ammo (amount depends on how much you want to shoot. For $25 you get in and Tickets to shoot all 4 stages. You can get back in line and re-shoot any stage for another $5 each time as many times as time will allow). Everglades ammo will be there to sell ammo if you run out of ammo. All adults need a drivers license or state ID. All youths must be accompanied at all times by their parent or guardian. You need eye and ear protection on at all times even when you are not shooting. You are responsible for keeping it on. If you don’t have any it will be available at a nominal cost. If you want a chair please bring one. you are welcome to bring your own cooler with your favorite non-alcoholic beverages. You will need your drivers license. For those that do not bring a hand gun we will have loaner guns. These are brand new Glock 17 or 19 Generation 4s and we are not charging a rental fee. You can buy ammo from Everglades Ammo at the event. If you bring your own ammo and want to borrow our guns you need quality factory ammo. Copper Jacketed Brass Cased. The range is a cold range (cold range means no loaded firearms except when a shooter is on the firing line and before they leave the firing line they show clear and lock the slide open) and a holster is not needed as you will not be shooting from a draw. If you bring your own gun bring it unloaded and in a gun bag or case. If you are going to shoot your carry gun and need to get it out of your holster and bagged for the event you will need assistance from a Range Safety Officer.